We congratulate our tireless Executive Director Cynthia Campoy Brophy for being named a Durfee Fellow! Durfee Fellows are recognized for their outstanding creative leadership and vision. She founded artworxLA 21 years ago to combat the high school dropout crisis through the arts. We are all honored to be on her team! New Foundations is a weekly workshop series designed to introduce students to a breadth of contemporary practices in the arts. Each two-hour hands-on workshop is led by a guest artist and can be in any art form. The goal of the workshop is to broaden students! perspectives about art and to introduce them to the guest artists material, methods and ideas. artworxLA students from the Hollywood Media Arts Academy visited Mirada studios, the production powerhouse behind Pan's Labyrinth, Pacific Rim and Cornelia Funke's Mirrorworld interactive apps. The students screened 7 films they made in during Nicole Emmons' Teaching Residency over the Summer of 2013. Mirada is a convergence of perspectives focused on advancing the art and science of storytelling. We built our studio as a perpetual idea machine, a story engine, to engage broader audiences in better ways — and the highest level of this engagement comes from pioneering hybrid narrative experiences. Sometimes the experience illuminates the inherent story values of a brand. Sometimes it leads audiences to uncharted places. Sometimes it's just an incredible idea that needs to be realized because it just does. We seek out these imagination-adrenaline rushes because they are the purest expressions of our core principles: mutual inspiration; inventing immersive story worlds; synthesizing archetypal oral tradition with modern technique; forcing arguments; cross-pollinating epiphanies, and fearlessly pursuing the horizon. artworxLA was featured on 89.3 KPCC Southern California Public Radio today! Mary Plummer interviewed our students, LA County Office of Education teachers, and our Executive Director Cynthia Campoy Brophy about the Hollywood Media Arts Academy. Check it out! California's high schools are not working for large numbers of young people, with students feeling bored, unchallenged, or unclear about the relevance of school. Linked Learning is a high school improvement approach that makes learning exciting and challenging. It connects strong academics with real–world experience in a wide range of fields, such as engineering, arts and media, and biomedical and health sciences—helping students gain an advantage in high school, college, and career. 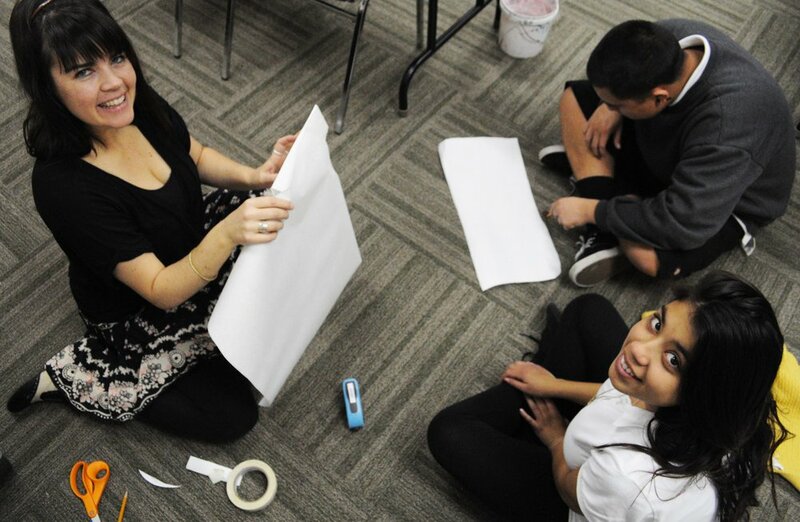 In January 2013, LACOE became one of 20 Linked Learning Pilot Districts in California, and the Hollywood Media Arts Academy was selected as one of two community day schools to implement the program—a high school improvement approach focused on new media that combines academics, career technical education, and real world experience in industry-themed pathways. Offers students personally-relevant, wholly-engaging, and rigorous academic and technical curricula combined with exposure to real-world professions. Helps prepare students to graduate from high school well prepared to enter a two- or four-year college or university, an apprenticeship and formal job training. Exposes many students in school to previously unimagined college and career opportunities. Learn more about Linked Learning by clicking here. The HeArt Project is now artworxLA! We're excited to present our new website complementing our new identity! has been 6 months in the making. It will enable students to find resources, donors to get involved and for everyone to learn about the story of artworxLA in much more interactive ways. The HeArt Project has worked for 21 years to bring art to teenagers at highest risk of dropping out of school and we have seen the impact it has had on so many students. It has taken a community of caring people and organizations to work together to succeed and we are grateful for your help. We know art works, but we have been told that we are the “best kept secret” in LA. We want to tell our story louder and better, so we changed our name and unveiled a new look. Our core philosophy and our method of practice are not changing. We have gained much experience over these past 21 years, and we remain committed to what works and how to do it. We just want more people to know about us. One of our board members, Grant Kirkpatrick, has led us through a brand transition that we officially completed on July 1, 2013. We have a high school dropout crisis in Los Angeles. The top reason students give for dropping out of high school is lack of engagement. A key engager to reinvigorating students in their education is the arts. We know that art works, and so we have our new name. We hope you like it and that you will help us promote the effectiveness of engaging our most vulnerable students with a rigorous arts program! This is artworxLA’s sixth year organizing a job fair for advanced-level students and alumni. Over the years, the organization has developed strong relationships with corporations that employ individuals with education and experience in the arts. In 2008-09, artworxLA implemented a pilot mentorship program pairing four advanced students with professionals in magazine publishing, commercial television production, painting, and poetry. The pilot was a success and inspired a desire to expose more students to employment opportunities in the creative sector — jobs they may have never considered. This year’s panelists included Hot Topic, MIRADA Studios, a storyboard artist that works with MARVEL, and a toy designer.